The Spanish Archaeological Mission of the University of Jaén have discovered an intact burial in the necropolis of Qubbet el-Hawa, West Aswan. Elephantine must have seemed a looong way from the royal court in Itj-Tawy in the Faiyum, and regional governors like Sarenput II enjoyed a much larger degree of autonomy, which, while paying tribute to their kings, allowed the governors to consider themselves as minor sovereigns. As befitted their status, the Elephantine governors built elaborate tombs high in the cliffs on the west side of the river (Qubbet el-Hawa) Surrounding their tombs were buried their relatives in smaller, less-decorated tombs. Excavation leader Dr. Alejandro Jiménez-Serrano told Nile Magazine that Shemai's burial chamber was found in the middle of the corridor of a tomb catalogued as QH34bb, which is still under excavation. In fact, they are still to excavate the main chamber, where there is likely to be another shaft. The question is, will the shaft be intact like Shemai's? Jimenez-Serrano said that Shemai's mummy has borne its3,800 years well: it is in good condition and is covered with a beautiful mask and collar. Shemai would always greet the dawn. Pictured is the east side of Shemai's outer coffin, featuring large wedjat eyes painted to correspond to the position of the mummy’s head. Shemai's mummy would be able to look out through the painted eyes to the sunrise, and share in the sun's daily triumph over death. Photo: Patricia Mora. (c) University of Jaén. Enjoyed this article? Want to know more about ancient Egypt? 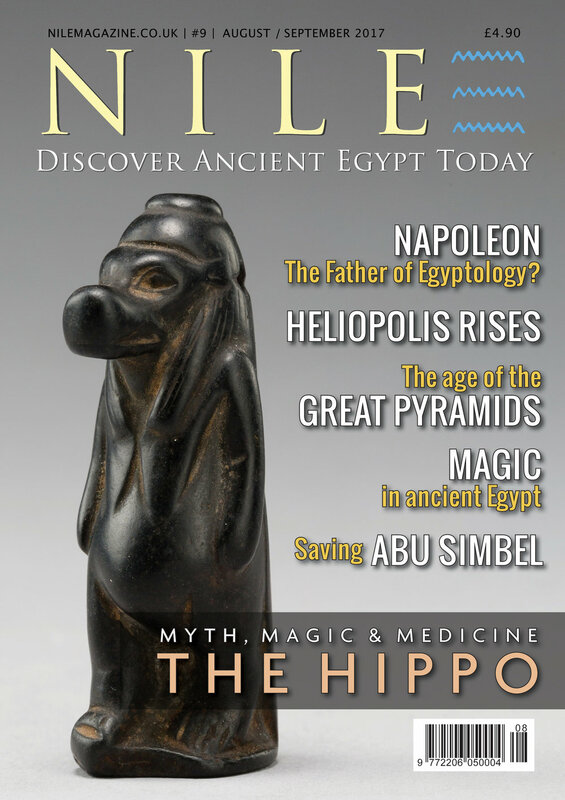 Subscribe to the print or digital editions from the Subscribe page, and enjoy your Nile time!